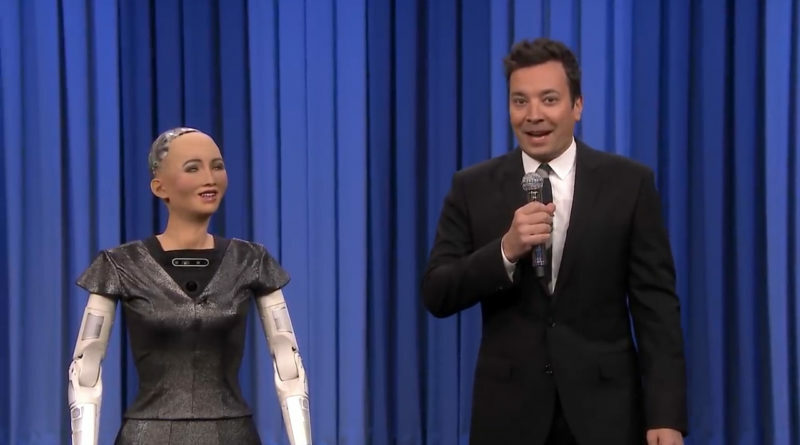 Sophia the robot recently returned to the Tonight Show to show off an impressive new skill. The robot teamed with host Jimmy Fallon to sing a duet of Christina Aguilera’s ‘Say Something’ while the Roots played the music. Fallon confirmed that this was the first ever human-robot duet in the history of the Tonight Show. After wowing the crowd with a beautiful performance, she got some couch time bantering back and forth with the host. Along with showing off her impressive wit, she also announced her new baby sister Little Sophia who will be available to consumers in 2019. Sophia, created by Hong Kong-based company Hanson Robotics, is considered the world’s first artificial intelligence-powered humanoid. Modeled after actress Audrey Hepburn, Sophia uses artificial intelligence, voice recognition, visual data processing, and facial recognition to interact with humans. The bot is designed to get smarter over time, analyzing conversations and extracting data. It’s unclear who gave Sophia singing lessons, but it seems they did an ok job. Sophia was initially developed to become a companion for the elderly in nursing homes or to help at places like theme parks. We’re assuming singer wasn’t in the initial plans. It is unclear if Sophia will pursue a music career. Rumor has it that she is a leading candidate to replace Fallon once his contract is up. Check out our articles on robots holding parking spaces and ones that herd cattle.